The 2018 Second Life Hair Fair is currently open, and runs through until Sunday, October 7th, 2018. The event features around 70 hair designers, and as with previous years, is being run to raise money for Wigs for Kids. Spread across six regions, four of which – Brunette, Noirette, Redhead and Blonde – contain the stores of participating vendors, while the remaining two, Foils and Streaks, are designed for those who prefer to shop by camming rather than walking (and are thus referred to as the Cam Sims). The four shopping regions are wisely lightly decorated in order to minimise viewer-side lag that might otherwise be created by having a significant amount of extra object and texture rendering. Stores are easily identified by the large signs located on the brick paths leading around the regions. These are laid out in such as way that wherever you teleport into a Hair Fair region, by following the red brick path in one direction and keeping to that direction, you’ll eventually visit every store before returning to the point at which you arrived. The full list of participating merchants can be found on the Hair Fair website together with SLurls. However, do note that direct teleporting is limited to the landing points in each region; to use the store SLurls, copy them into local chat once at the event, then right-click on the display link to display an in-world beacon and arrow you can use to navigate to your desired store. All items purchased at this event will have a minimum of 15% of their price donated to Wigs for Kids, and for the men, stores selling male / unisex hair are denoted by a large ♂ symbol floating over their roofs. When purchasing, always check to ensure items are received; should you encounter problems, left-click the vendor / pack from which you made a purchase, this will trigger an automatic redelivery. However, do note that the list of purchasers held by each vendor / pack is only so long, so it is essential you check as soon as possible after purchase in order to avoid the vendor / pack dropping your name. Those wishing to avoid spending too much time in the event regions can join the Hair Fair Demo group (no charge for joining). Notices with demos posted by participating merchants within the group allow styles to be tried prior to visiting, so that desired hair can be identified and the SLurls used to make visits to the required stores. Note that this is the only in-world group associated with the Hair Fair. If by chance you don’t find hair to suit your needs, there are numerous donation kiosks located along the paths of the regions, so you can always make a L$ donation directly. 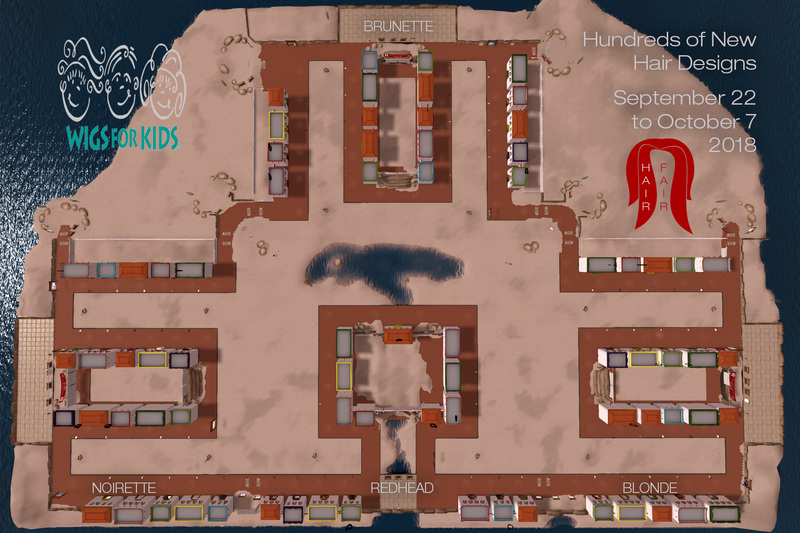 There are also Bandana Booths to be found, which also give 100% of donations to the cause, and from which you can obtain Hair Fair Hares. The Hair Fair shopping regions offer open spaces with minimal additional objects / textures to help reduce viewer-side loads and lag. For more than thirty years Wigs for Kids has been providing hair replacement systems and support for children who have lost their hair due to chemotherapy, radiation therapy, Alopecia, Trichotillomania, burns and other medical issues at no cost to children or their families. The effects of hair loss go deeper than just a change in a child’s outward appearance. Hair loss can erode a child’s self-confidence and limit them from experiencing life the way children should. With an injured self-image, a child’s attitude toward treatment and their physical response to it can be negatively affected also. Wigs for Kids helps children suffering with hair loss look themselves and live their lives. Families are never charged for the hair replacements provided for their children; Wigs for Kids rely completely on both the donation of hair and / or money to help meet their goals. Read more about Wigs for Kids mission, and discover how hair can be donated.